Listen to Egesa FM Kenya Radio Live Online.Listen over 50 Kenya FM Radio Stations online. Enjoy Live Streaming of Kenya Music,News 24 by 7 Online. 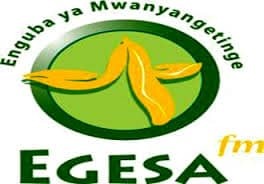 Egesa FM broadcasts in ‘Ekegusii’ language of the Kisii community.It broadcasts on 94.6FM, and 103.2FM in Nairobi. It is the only 24 hour Kisii station in Kenya.The station aims to be the voice of people,keeping the Kisii community and those surrounding them together. Within the first few months of broadcasting, Egesa FM became the Kisii station of choice. The primary target of this stations is middle to lower social class residing both in the rural and urban areas, while the secondary target is the upper class. All FM plays well in Google Chrome or Mozilla Browser. If You face any problems in listening to this Station Click On Contact Us button. You must install flash player to listen to this Station.